So, you’ve volunteered to crew for Western States. Now what? Don’t panic. It’s actually a relatively simple process. If your runner has done his job, he will have provided you with adequate instructions for what he expects. All you need to do is follow his instructions, show up when and where he expects you to be, with what he expects you to have, and be present and attentive. Sounds easy enough, right? It can be, if you take some time to prepare. First and foremost, be sure to read the Western States Participant’s Guide. It contains lots of useful information, including important rules for crew so you don’t get your runner disqualified, detailed maps and directions so you don’t get lost, and excellent descriptions and troubleshooting recommendations for some of the more common ailments your runner may face. And, make sure either you or your runner brings it to the race. Know your runner’s plan. If he has target splits, make sure you know what they are so you can be ready and waiting for him at each aid station. Also, be prepared to adjust if your runner gets off his plan. For example, keep track of the time of day so you can anticipate if he may need additional clothing or lights sooner than he originally planned. Craig gives me his estimated splits in time of day, not elapsed time. For instance, he expects to arrive in Foresthill at 4 pm (not 11 hours). This makes it much simpler late in the race when the brain starts getting soft. Have your own plan too. My plan is based on crewing for a fairly fast runner (sub 20-hour). Your experience may differ, but you may still find some of this information helpful regardless of how fast your runner may be. If you won’t be returning to Squaw Valley after the race, check out of your hotel/condo before heading to the start so you can head down the mountain as soon as the runners have started. While there is plenty of time to get to Robinson Flat before the runners start coming in, I like to get there early enough to park at the top and avoid the shuttle. Do all your shopping for both the runner and the crew the day before, so you don’t have to stop in Auburn for anything except gas and ice. For Craig and crew, our shopping list usually includes Pepsi, Mountain Dew, V8 juice, bread-turkey-cheese-avocado for sandwiches, bananas, grapes, melon, Pringles, pretzels, nuts, M&Ms, and of course Craig’s secret fuel: pork & beans. I like to bring Tupperware containers so I can prepare the sandwiches and melon ahead of time and keep them fresh. And, don’t forget lots of water for drinking AND DOWSING both runner and crew. It’s a long, grueling day, so it’s important to take care of yourselves as well as your runner. Toddlers and dogs are particularly susceptible to the heat, and should be monitored for signs of dehydration and overheating. Pacers especially need to eat and stay hydrated during the day so they’re not depleted when it comes time for them to run. Be sure you have a full tank of gas before heading up the Foresthill divide. While Foresthill does have gas stations, I find it much easier not having to worry about gas for the rest of the day. Have both a large cooler and dry aid box that you leave in the car and a smaller cooler and aid bag that you carry to the aid stations. You can restock the smaller containers from the larger ones before heading to each aid station. Backpacks make good aid bags. We also have a soft-sided cooler bag with a shoulder strap. Both are easy to manage, especially on the 3 miles down to the river (hint: wear comfortable hiking shoes). Bring a lightweight folding chair and ground cloth so you can set up your aid spot and have everything out, visible, and in reach every time. Besides food and electrolyte drink, you never know when your runner is going to need gels, S-caps, ibuprofen, sunscreen, Tums, Vaseline, Band Aids, baby wipes, flashlight, batteries, etc. or a fresh bandana, shirt, shorts, sunglasses, socks, hat, shoes, etc. Often just seeing an item out will prompt a runner to use it. If saving time is important to your runner, having two sets of bottles may help. That way you can swap them out instead of having to refill a single set each time. Also, if you have the luxury of multiple crew, it usually works best if you assign each crew member to a different set of related tasks (e.g., one person to manage bottles and fluid intake, another person to track food and pharmaceutical intake and go through the check list of possible fanny pack replacement needs, and a third person to deal with physical needs like massage, ice rub downs, blisters, chaffing, sunburn). Always restock your smaller aid station cooler with fresh ice each time so you have ample ice to put in water bottles, rub on your runners legs, or put in his hat. Separate zip lock bags keep ice designated specifically for water bottles from getting grimy. I also keep a small hand towel soaking in another zip lock bag in the cooler so we always have a VERY cold towel to drape over Craig’s head and shoulders. Bring lots of different clothing options. Robinson Flat, Dusty Corners, and Michigan Bluff can be blisteringly hot while the river and Hwy 49 crossing aid stations are always damp and cold once nightfall sets in. Bring extra lights and batteries for yourself as well as your runner. And bring the necessary comforts to the finish line for both runner and crew (e.g., a warm change of clothes and loose fitting shoes or sandals for your runner and sleeping bags and pads for everyone). You might even consider bringing a tent. 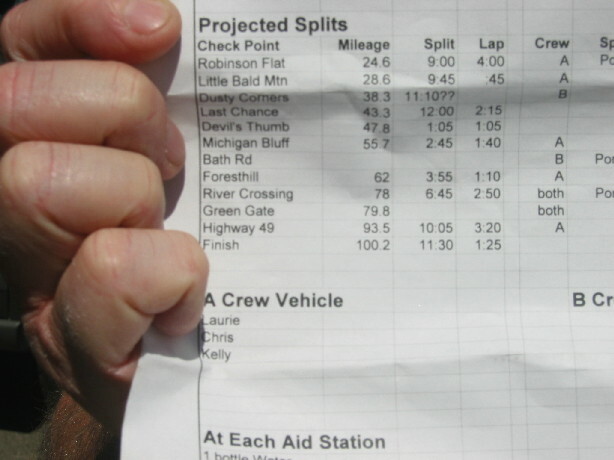 Have a pad of paper and pencil so you can keep track of the competition and report out to your runner how close he is to the next few runners in front of him. This becomes especially important toward the end of the run when the racing really begins as it helps to gauge if your runner is gaining or losing time to other runners. If he is close to someone at Hwy 49, you may also want to go to No Hands and Robie Point to give him additional updates. If you have failed to get times for previous runners, DON’T GUESS at the number of minutes ahead they are. Just get accurate numbers at the next aid station. Be prepared for a myriad of runner emotions throughout the course of the day, and don’t take any of them personally. Your runner will be alternately hot, tired, elated, dejected, sick to his stomach, catching a second wind, hungry, thirsty, and generally in pain somewhere. Do your best to address his needs, troubleshoot issues, and remain realistically positive. Unless your runner is physically injured, don’t allow him to contemplate quitting. Nausea, blisters, heat, and sleep deprivation will all conspire to challenge his resolve, and your permission may be all the excuse he needs to quit. Don’t offer this as a solution to those problems. If you are the type who doesn’t like to see others suffer, you might have to work hard at this. Also be sure to take care of your own physical and emotional needs. It’s going to be a long day and night with hours spent in the car followed by more hours sitting at aid stations punctuated by mere moments with your runner. Try not to let it show when you get hot, tired, or stressed. He has worked very hard and invested a lot of time preparing for the race, and he is counting on you to be focused on him. Don’t burden him with your problems. He’s got enough on his mind. Finishing WS is a big accomplishment for both runner and crew. Take the time to enjoy it. Definitely take pictures. Hang out at the finish line. Attend the awards ceremony if you can. Talk to other runners and crews. Learn their stories. Share yours. Do you have any crewing secrets you’d like to share? Here’s a tip for someone fortunate enough to have two sets of crew. We used this plan to great effect at the last race to crew for both Caren Spore and Simon Mtuy. Having two sets if crew gave us the luxury of being able to attend to our runners at more aid stations. Thankfully, Caren are Simon are evenly paced so there was little waiting between runners. In practice there was a third crew who packed up the runners stuff from Squaw Vallley. Fri. evening. Both sets of crew camp at Robinson Flat overnight. Crew 1 drives out of RF via N44 to Duncan Canyon Aid Station to crew for runner there*. Crew 2 remains at RF to attend to runner at that aid station. Crew 1 re-joins runner at Dusty Corners. Crew 1 and 2 both meet runner at Foresthill (or Bath Road) and prepare for the nightshift at Green Gate and HWY49. * Make sure you are well clear of the N44 (i.e. RF-Millers defeat) area at least 1-2 hours before the first runner comes through. Being caught with a car on N44 during the race may lead to a disqualification of your runner. I love this post…. I dropped at mile 75 at the SD100 this last weekend… It’s only my 3rd 100 miler but my first DNF… I ran without pacer or a serious crew… my dad was driving around checking up on me during the race.. I saw a nice warm car at mile 75… and even though I wasn’t injured, peeing blood, or passing out… I dropped. I was a sick, and my head was getting to me. Next time… I’ll just walk to the next aid station. @Paul Charteris – I think the road is N43 but be careful if you do this. You don’t want to disqualify your runner. @Ted Nunes – Bummer, Ted. I was at AC100 a couple of years ago and was completely done as I stumbled into Chantry Flats well off my intended splits. Any hint of quitting from my crew would have been enough to allow me to DNF. If any of them did think I should quit they didn’t say it. I was there maybe 15 or 20 minutes, walked out with a cup of soup and ended up running fairly well from the top of Wilson in. A serious crew (and pacers) can really make a difference. Oops, many apologies. Great post LAURIE! I assume Craig is busy tapering somewhere. Thanks Laurie, all very helpfull. Wow, Laurie! You get my vote for ultra-spouse of the year! @Ted Nunes – Yes, I’ve been part of many crews that have kept their runners in the game. 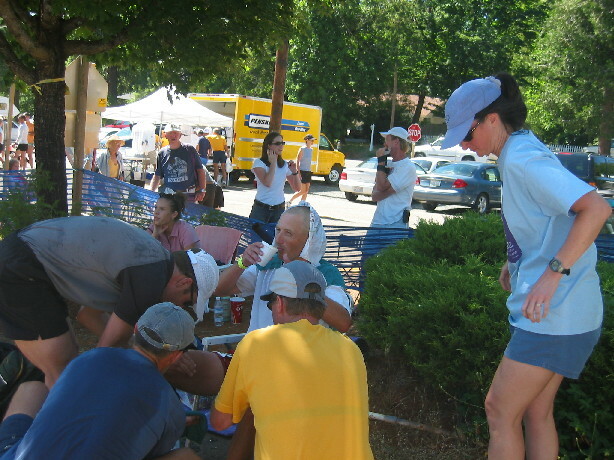 It’s never easy at the time, but the runners have always been extremely grateful afterward. @Pam – Thanks, but in the interest of full disclosure, I must admit that I unfortunately will not be at WS this year. My job is taking me to DC that same weekend, but Craig will be in BK’s excellent hands. You have it down to a science Laurie! Nice job………. Important! 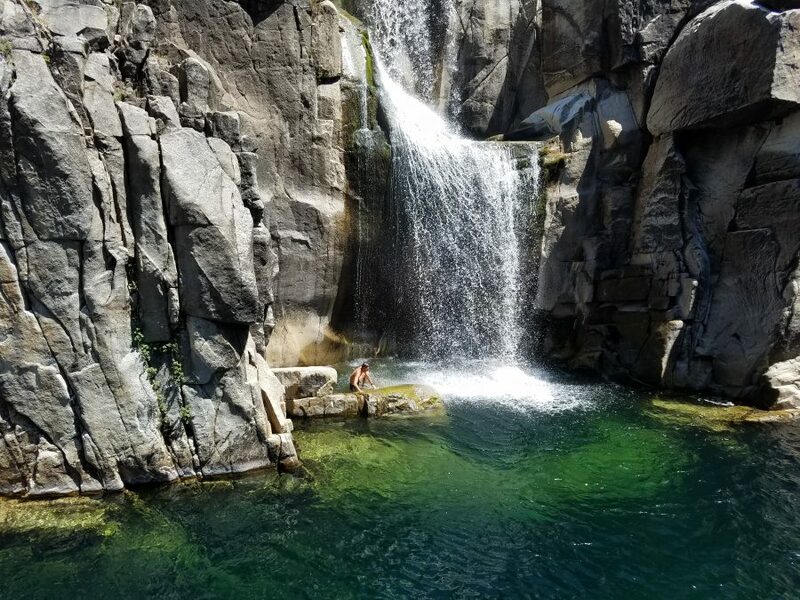 Crew vehicles are strictly prohibited from using the Baker Ranch/Soda Springs Road between Soda Springs and Sailor Flat, and from using Road N-43 between Mosquito Ridge Road and Robinson Flat. Great post! One thing from my wife Shelly who has also crewed five times at WS: If you don’t feel the need to see your runner start at Squaw consider driving down to Auburn on Friday afternoon after the pre-race briefing. Shelly always does this and it allows her to set up the tent in a great spot at the high school, shop stress free at Raley’s, have the boys splash around in the Comfort Inn pool, and gives her an early start up to Robinson Flat on race morning. Great Post. The only thing I could add for a crew member is to try to pick a runner who is much, MUCH less needy and high maintainence than Craig. At Javelina I brought my family over to your crew station to show them what a real crew was. Craig was getting the full sponge-bath, leg rub, chafing treatment, little umbrellas in-his-drink, deluxe day-spa package. My wife just looked at me, rolled her eyes, and said “don’t count on it!”. @Nathan Blair – Thanks, Nathan. You’ll have a blast working with Craig’s brother. He’s a kick in the pants. Have fun pacing and crewing at States. @Matt – Agreed. When it comes to racing, Craig is high maintenance, but lest you think it’s always about him, know that we apply the same treatment to all the racers we ever pace. @LT – Thanks Laurie for writing this post. @Joe Kulak – Geeze, Joe, you are gonna make all of us feel pathetic. Those of us that aren’t as talented as you need every advantage we can get. I finally read your article. Good read. It occurs to me that Craig should be paying you for your services… I mean in some currency other than pork and bean farts. Great post. One time, my runner was in such great shape, and running faster than I expected, he caught me napping on the next aid station. I remember him banging on the window. Oops. Pork and Beans…now I know what to try at WS this year. For a first timer that was perfect! Thanks for writing this Laurie.